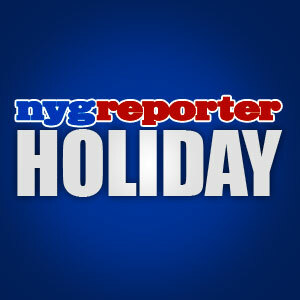 NEW YORK – It is Christmas Eve everyone and the Giants play the Jets. It’s going to be a fun day with family enjoying the game for me. I hope everyone enjoys their Christmas Eve and I look forward to discussing the game on Monday. This is bigger then the need to get a win, this is a battle for New York. The fans all know it and so do I. There is a lot of pride on the line in this game for both teams and coming out with the win is a must. Just like in that movie “The Invasion” we need to get some Big Blue jerseys in MetLife stadium for the game. Excuse me, I mean Giants stadium. The Giants have to play and beat the Dallas Cowboys next week in the season finale at MetLife stadium. That will surely be one of the hottest tickets of the year because the Giants playoff hopes depend on that win. The fans will be out in force rain, sleet or snow for this one. I expect the tailgating to be huge for the finale and fans can have a blast just hanging out until kickoff if they weren’t fortunate enough to get tickets. Never drink and drive of course and be sure to have a designated driver to get you home. Remember, be safe, kids go to games too. Whatever religion you are or what holiday you celebrate, I wish all of you a happy holiday season equally. I celebrate Christmas and write about what I know. I hope you can all respect that. Feel free to leave a comment about what holiday you celebrate and how you do so. – Rodney Hampton was generous enough to stop by with a final Christmas wish for our readers and to answer five little questions. I think our readers will enjoy it and yes, this is the real Giants RB Rodney Hampton everyone. Be sure to check out Hamps Camp (www.hampscamp.com) for his football camp and after school programs in the Houston, Texas area. Hello again Rodney and thanks for taking the time to answer a few questions. Merry Christmas to you and the family! Hampton Answer: Rudolph the red nosed reindeer and Santa Claus is coming to town. Classic ABC movies for the holidays. 2. What is your favorite Christmas dinner? Hampton Answer: I don’t really have a favorite dinner. We always have so much food around, a feast, that there is always something good to eat. 3. What is your favorite Christmas drink? Hampton Answer: a glass of red wine, a merlot. 4. What type of music do you listen to on Christmas eve? Hampton Answer: I have a piano that plays by itself and we love to listen to the Christmas carols from there. The piano music really puts me in the Christmas spirit. 5. What Christmas traditions do you and your family have and celebrate? Hampton Answer: We play a game called The White Elephant Gift Exchange (Google it for the rules) on Christmas day. It’s so much fun because no one can control the gift they receive and some of us purchase gifts that no one wants. It’s so much fun! Rodney: I’d like to wish each of you a very Merry Christmas and a Happy New Year! Take some time and reflect on the year. Make a list of at least five things that you are thankful for. Sometimes we get too consumed with all of the gifts and money being spent during the holiday season. Take some time this year and focus on the small things (sometimes these are the things we take for granted). Remember the reason for the season, and be sure to have a safe and joyful holiday! May God bless each of you!!! Robert: Merry Christmas and Happy Holidays to all of our readers! Thank you very much for continuing to read our articles and see a different perspective on the team. Let’s get in the playoffs and do some work Giants! Eli Manning needs to be in the Pro Bowl. So do a bunch of other players this year. God Bless all of you and your families! Thank you to the military stationed all over the world who cannot be home this year. God Bless and protect you always! This entry was posted on Saturday, December 24th, 2011 at 6:01 AM and is filed under 1990 New York Giants, 2011 Fantasy Football, 2011 New York Giants, 2011 NFL Draft, 2011 NFL Playoffs, 2011 NFL Pro Bowl, 2011 NFL Regular Season, 2012 Pro Bowl, Big Blue, Bill Parcells, Chris Mara, East Rutherford, Eli Manning, Ernie Accorsi, G-Men, George Martin, Giants, Giants Coaches, Giants Draft, Giants Front Office, Giants History, Giants Roster, Giants Stadium, Giants Super Bowl History, Interviews, Jerry Reese, John Mara, Jonathan Tisch, Justin Tuck, Kevin Gilbride, MetLife Stadium, New Jersey, New Meadowlands Stadium, New York, New York Football Giants, New York Giants, NFC East, NFL, NFL Draft, NFL New York Giants, NFL Playoffs, NFL Pro Bowl, NFL Schedule, Nilay Shah, NY Giants, NYG, NYG All-Time Records, NYG Blog, NYG Charity, NYG Draft, NYG Exclusive, NYG Fantasy Football, NYG Holiday, NYG Playoffs, NYG Pro Bowl, NYG Reporter, NYG Road Warriors, NYG Schedule, NYG Story, NYG Super Bowl, NYG Website, nygreporter, Pat Hanlon, Perry Fewell, Pro Football Hall of Fame, Roger Goodell, Steve Tisch, Timex Performance Center, Tom Coughlin, Tom Quinn, University of Albany, Wellington Mara, Wounded Warrior Project. You can follow any responses to this entry through the RSS 2.0 feed. You can leave a response, or trackback from your own site. Rob – I am spending today with my family watching the games. Both my wife and I are big NYG fans, and my son is a Lions fan(born in Detroit area). Today is a big day for the Lions too. They win and go to the playoffs for the first time since the Sanders era. I would love nothing more than to quiet the Jets fans today, since all they do is talk! Many thanks to Rodney Hampton for his contributions to his many fans! Best Wishes and Merry Christmas to all the Giants fans out there today!! Hey AJ, sorry it took a minute to reply buddy but things have been crazy with the holidays lol I hope you had a great Christmas with the family buddy! What a heck of a game that was tis weekend. I am pumped to see what happens against the Cowboys next weekend. Rodney Hampton has been awesome. I cannot say enough nice things about that man and his family. Merry Christmas to you Rodney and your family if you read this! PS – The Lions were my sleeper pick from before the year started. Tell your son to enjoy the ride and Congrats from me! merry christmas and happy holidays to all my fellow big blue fans and to everyone out there.be safe and have a great holiday season.thank you rodney hampton for taking time to answer all of our questions,it always means a lot chatting with the real deal,and rodney,you are the real deal,merry christmas.im spending the day in N.C.in the beautiful city of asheville with the wife.we will find a tv at 100pm for the game.rob,what can i say,this is it,the g-men can not back track now..its all in front of them.if for 2 weeks the g-men need to play team ball offensively and defensively,this is the time to do it.i hope no one gets seriously hurt,but i would like to see sanchez on his back all day.lets get it done blue.merry christmas rob,lets be talking about playoffs monday.god bless,be safe at the game today,things could get rowdy lol. Thank you very much Bobby and the same to you! 441pm,rob we did it.bragging rights,yes. merry christmas AJ and happy holidays to all my fellow blue bloods out there/congrats on the detroit game for your son,its been a long time for detroit,good stuff.also great to have bragging rights again for 4 years lol.wouldnt it be interesting if the g-men win sunday night and get the home playoff game against detroit lol.enjoy the holiday,lots to discuss this week on the blog.here we go,its playoff atmosphere from now on.game flexed to sunday national audience,awesome.